North Shields’ winning streak was brought to a halt with a heavy defeat at the hands of Stoickton Town on Saturday. Two goals in the first half from Dale Mulligan gave the hosts a commanding lead going into the break. Peter Bulmer made things worse for the Robins when he added a third goal midway through the second half. And despite a late goal from Ryan Carr to reduce the arrears to 3-1, a fourth for Stockton from Jake Petitjean in the 88th minuteensured that there was no way back for the visitors. 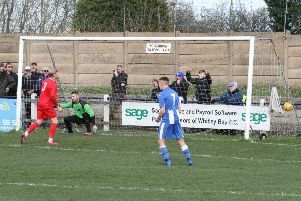 Carr’s goal came in the 80th minute when he towered above his marker to powerfully head a corner past the rooted goalkeeper Michael Arthur. Earlier, Carr had been denied by Arthur when the home stopper pulled off a tremendous save .